Back by popular demand… Please join us on a tour through North Campus’ urban forest led by horticulturalist and landscape designer, Wayne McCutcheon. The tour will highlight some of campus’ unique plant and tree specimens, the various water features and its overall landscape. This tour has been re-named Campus Water Features: Flora and Fauna Tour to be more inclusive of the diverse elements of the tour. 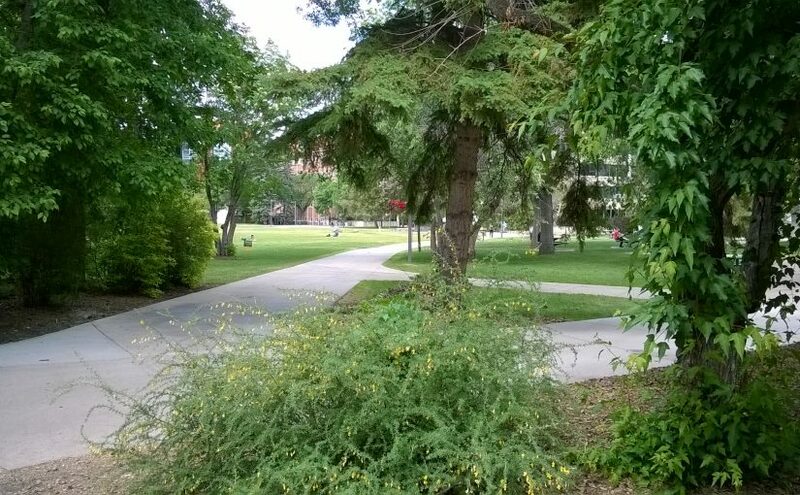 For everyone who has been associated with the University of Alberta, its campus has a place in our memories – and its trees through the changing seasons are very much a part of those memories. Much of the original native forest which provided the back drop to the University’s first sod turning ceremony has changed. Many new trees have found their way onto campus, including several specimens not native to the Edmonton area. The campus has inherited a truly lovely urban forest of 4,000 trees. We will be meeting at 3:45 p.m. in front of the Administration Building, facing the bus loop, at the University of Alberta’s North Campus. The tour will begin at 4 p.m. until approximately 5:30 p.m. Please remember to wear comfortable walking shoes!